Our first morning in Vegas....the kids were excited to get going. The kids went swimming almost everyday...it was 21-22 C everyday. Cold for Vegas...beautiful for us. 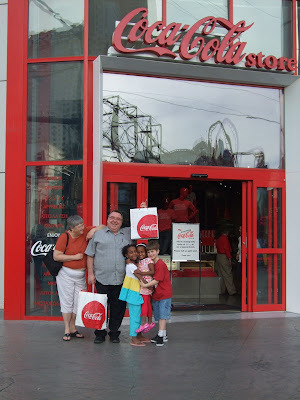 Just outside the Coke store...Howard and Sue and the kids. 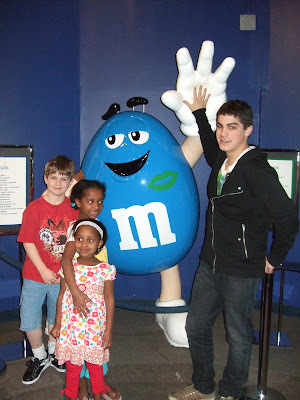 The M & M store.....can't believe it was 4 stories. 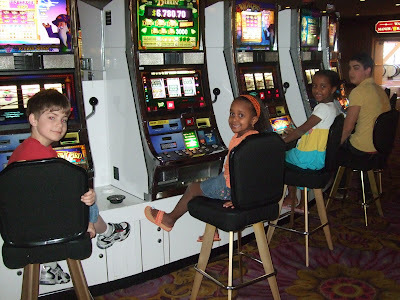 Playing the slots......not really....security came very quickly....we asked if we could just take a picture. We were in Las Vegas last week. We took 4 of our kids with us and we had a blast. The girls were so excited to get on an airplane. This was the first airplane ride since Ethiopia. They were most excited about the TV's that they could watch. The weather was beautiful....it was 20-23 all week.....we came home to -20...what a difference. Some highlights of the trip were the 2 story Coke store...got some fantastic glasses from there. Right beside the Coke store is the 4 story M & M store. I have never seen so much m&m stuff....it was unbelievable. They even had a 3D m&m movie playing on the 3rd floor. The shopping is fantastic in Vegas....loved the factory outlet mall. There was also a Ross store right across the street from our hotel...it doesn't get any better then that. Some good friends of ours went with us...Howard and Sue.....it's always nice to have friends to hang out with on trips. We saw Danny Gans...loved it. I took Kyle to see Blue Man Group at the Ventian. It is a great show and Kyle loved it so much he didn't want it to end. We did a lot in those 4 days that we were there and the kids had a great time. Denaye and Maya both love to travel.....they were fascinated by all of the lights and all of the action.....makes home seem pretty boring. Sam and the girls love to stay in hotels, so this was one of their favorite parts. I missed my bed, but it was a fun trip for all of us. Rod and I live in Alberta, Canada. 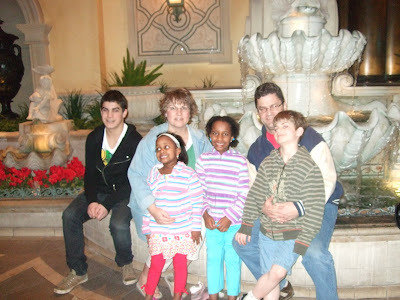 We have 6 children, 4 biological boys and 2 girls that we adopted from Ethiopia. We have 2 blogs....one is about our journey to adopt our 2 girls and life after adoption and the other is about Sam and his miraculous entrance into this world when he was a born. Our family consists of 6 kids and 2 adults.....Rod my husband works in the media and has his own business. Me.....well I have many titiles.....just to name a few, taxi driver, chef, finance manager, referee, business partner, computer analyist, school teacher and the list goes on, but the one I cherish most is mom. Taylor, our oldest son is in school heading towards being an engineer. Jesse, who just graduated from highschool in 2008 is heading towards Europe and the wide open fields. He has the travel bug and is leaving us for a bigger adventure. Kyle, who is our gentle soul is a budding photographer and is still in high school. Sam who is our miracle baby(there is a link to his blog) is a hockey player and is just having a great time being a kid. 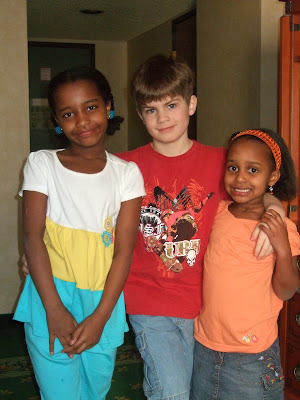 And then of course our girls......Our journey to adopt Denaye and Maya started in March 2006. Lots of paperwork and a lot of waiting. We have been blessed with the 2 of them who joined our family on September 6, 2007. There is a link that will give you our timeline if you are interested. If you have been with us since the beginning thanks so much for your support and your prayers...believe me I cherished it all. If you are just tuning in I hope you enjoy the ride.....it gets more interesting everyday!! !